Did I mention its pretty hot here, yes I think I did. Yesterday we were without power the whole evening and night! Afternoons can get quite humid. These days, we don’t even feel like have a cup of hot tea. So I resort to making iced tea. Sometimes, I just get the herbal tea bags and infuse it in hot water in the morning and put it away in the fridge to cool. Today I decided to make some lemongrass and mint iced tea. There was a time when I had a huge lemongrass plant in my garden and I was giving away parts of it to friends and relatives to plant in their garden or pots. Now I have to either buy it or get it from my friends! One of friends gave me a huge bunch of lemon grass just a few days. I am enjoying making iced tea and normal tea with it. 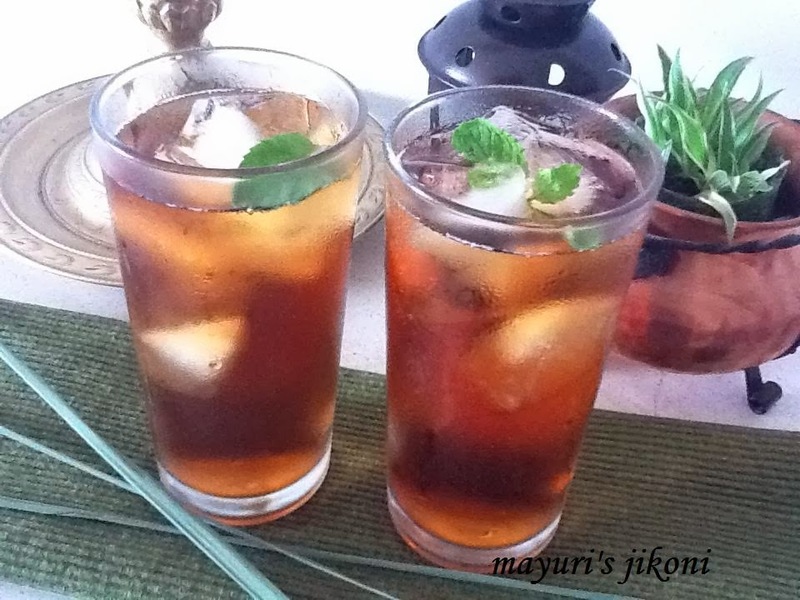 Make this refreshing and cooling iced tea on a hot day or serve it after a heavy meal. Add the tea bag, lemon grass, mint and lemon zest into the hot water. Put the mixture in the fridge till required. Add a few cubes of ice into 4 glasses. Strain the infused liquid. Add sugar, honey or sweetener and mix well. Pour the tea over the ice cubes and serve. I guess the juice would be really refreshing ..
Do link your entries .